Looking to customize your reward tier a bit? 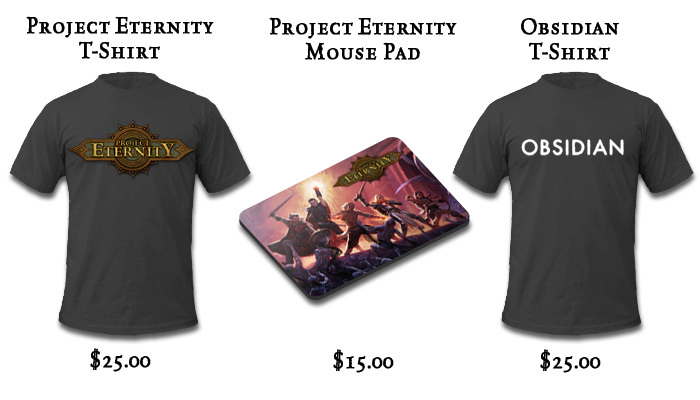 Add the following on to your pledge using the Manage Pledge button at the top of the Project Eternity Kickstarter site. When making an add-on you need to manually change the amount of your pledge when using the Manage Pledge button. You can change your pledge as much as you want during the Kickstarter campaign, you will only be charged after the end of the campaign based upon what is listed as your pledge at that time. Note: All add-ons require base pledge to be at the $20 tier and above. For T-shirt add-ons, we will ask for the size that you want at the end of the Kickstarter campaign in a survey that will be sent to you in e-mail. As a quick tutorial on how to add add-ons, goto the Project Eternity site on Kickstarter and then hit the Manage Your Pledge button. The reward tier you had already selected will still be selected and the amount will be in the big box at the top. All you need to do is add the dollar amount that covers the add-ons you would like to your pledge and enter the new total number. For instance, if you are at the $35 Pledge level and want to add one Digital Download, you would enter $60 as your total pledge. After the Kickstarter campaign is over, we will send you a survey that will let you explain how you wanted to additional money pledged should be used. We have also been listening and reading your feedback on Kickstarter and have some changes that are happening as soon as this update is posted. One thing we are not updating just yet are the stretch goals but don’t worry, those are going to get updated very soon. Oh, and we are putting a schedule together for updates that will include guest stars almost every day – Josh will be talking more about the design tomorrow (Sep 20), our unflappable CTO Chris Jones (architect of the Fallout and Arcanum engines) on Friday (Sep 21), and I think we will be able to squeeze one in from Mr. Tim Cain over the weekend. So, what are those changes?!? You asked and we are delivering. In conjunction with GOG, we are going to offer a DRM-free version of the game for our Kickstarter Backers. When the campaign ends, you will be able to choose whether you would like a key from GOG or Steam. For our Mac friends, we are still working on a DRM-free option, since GOG does not currently support the Mac. Oh, and the great guys at GOG are having a special right now on all of the great Infinity Engine games (ends September 21st!) so check that out as well. We are adding a $50 and an $80 digital tier. The $50 tier will get you the digital version of the game, the soundtrack, the digital version of the Collector’s Book, a collection of wallpapers made for multiple resolutions and multiple monitors, high resolution concept art, a high resolution version of the map, and ringtones. For the $80 tier, you will get all of that plus a digital copy of the strategy guide, and a second digital download of the game. Lastly we want to announce that we are going to give our backers at the Collector’s Edition Box Level ($140) a little extra today and that is Beta access to the game! That’s just a little taste of what we will be adding into tiers in the coming days and weeks through stretch goals and the occasional random act. Join the discussion on Obsidian's forum thread! I totally missed the follow ups, but let me say that you guys make good points, and it's a breath of fresh air to stumble on an old conversation that was handled with intellect and respect. Moreover, if obsidian *chooses* to use the DRM on steam, they are choosing to insult those who decided to give them money up front. Steam is not DRM. When it was introduced, one of the goals was DRM, for Valve's own software. However the use of Steam's DRM for third party software is 100% optional and there are many titles on steam that do not use the steamworks DRM. Thus at present, Steam is a digital store/channel, that also comes with optional services (eg achievements, chat) that and optional DRM. Steam is not DRM. Thank you so much for the DRM-free option. I'd really like an official explanation on this and the question that the extra shipping costs should be included in the pledge or not. Ah, so to add on the Almanac and the expansion I'd bid my tier +$35 and reply to their email? No if you want the beta key you just add $25 to your current pledge,unless your current pledge includes it already in which case you don't need it..After the kickstarter has finished you will get an email from them asking what the extra $25 was for you then tell them it was for Beta etc and they add it to your stuff. I realy want the beta key and im currently in the 35 braket, so if i want the beta key, i have to select the 35 braket and have a pledge of 60? Maybe I'm mistaken, but it looks to me like the reward is automatic for putting in the requisite amount above your base pledge, so for being a in a digital-only tier, if you put in $25, you'd get an extra digital download, an expansion pack, digital almanac, digital strategy guide, and early access beta key. If you only put in $20, you'd get everything except the extra download and beta key. Again, I'm might be mistaken in how I'm reading this, and it's really unclear to me whether the additional downloads for the $25 and $65 tier would also include additional downloads of the expansion pack. Same problem here: I can edit the amount, but I don't find any option to select which extra's I'd want. The shipping cost for physical tiers will be in ADDITION to my pledge, right? Ok I see where you can add more money to your pledge, but for the life of me, I don't see where you actually choose the add-on that you want for that extra money. @Antony To add an add-on, you hit the Manage Pledge button and make sure the reward tier you want is still selected. Then you add the amount of the add-ons to the what is in the Pledge Amount manually. So, if you have the $35 Tier selected and want to add the Strategy Guide, you would make sure that $35 is still selected and then enter $42 in the box. How do you indicate which add-ons you wish when adjusting a pledge? I think you should update the "How to do an Add On" to let people know they'll receive the info AFTER the pledge drive so they know THAT is how it all works. I can see I wasn't the only one confused as to how the Add Ons were going to be claimed. Hi Jesse - you need to manually update your pledge. Add the total of your add-ons together with your tier and enter that total. Thanks for the support! I opened the "Manage Pledge" window. I see the pledge I selected. I do not see anything related to add ons or a way to add the add ons. Tried Firefox in Ubuntu 12.04 and the default browser on a Galaxy Nexus (4.1.1). ok can someone explain to me about the add on's? Here is what i did i was at $35 then i bump that up to $50. So how would i add a ad on? Is it just automated when you bump up your pledge? How about a cloth map add-on? I'd trade the soundtrack, ringtones and wallpapers in a heartbeat for a cloth map to be included in the standard box. There is no option for expansion. You just change the amount in your pledge, that's it. Will you consider making a box version of the expansion pack ? I'd love to have it as a box version, but I will pay 20$ for the digital version if i'm sure there won't be a box version. Well you have only to add 20$ to your pledge right? I would add that for expansion but i dont know to mess anything up. I have no option for the expansion addon, is it removed? Changed my pledge now +20$ for the expansion. That's a pretty good deal. The surveys, as my experience tells me, are issued after the funding succeeds. Simmilar question here. My base pledge is $35, I've entered $42 to add $7 hintbook. Now I want to add expansion pack, so what I did was keep base pledge at $35 and entered 62$ as total pledge. But where is the survey about the extra money distribution? It sounds like you can pre-add the digital expansion at a cost of $20 to any pledge between $20-$140, (as $165+ have it included in their rewards). However the Kickstarter pledge page does not show that option. I am currently pledging $80 and would like to add the $20 expansion. How??? Ditto. We were directed to "update 4" but this is very vague on how to add the add-ons. As with those above - how do we pledge for the expansion given it's only for a limited time? (If its a "do it after the campaign" assume that's not outside the limited time) Also just confirming it's possible to get the expansion if pledging for a physical tier under $165 (I.e $140, plus the $20 for the expansion). I've added $20 to my pledge to cover me for the expansion, but I don't see any way to select add ons from my manage my pledge page. Do I just wait until the campaign finishes and then choose to distribute my pledge so that that extra $20 covers my expansion as intended, or is there some way I can lock that in before the end of the campaign? For clarification, if I want the expansion and the early access beta key, I would add $45.00 to the total price? @emptybook At the end of the Kickstarer campaign you will receive a survey that will let you go over how you would like your pledge distributed. How do you know what people have asked for: is there a script set up to recognise tier + $x = extra automatically? Or is it manual, and come April 14, will I need to email and say? How do you differentiate between the two $25 options? Or do you get both? If I edit my donation amount, will it still show me as a backer to the tier I picked? Any chance of the Expansion being added as an add-on? I want a map. Can i have a map? What do i have to do to get a map other than draw one myself? Can I have a big map? How much for big map? @Adam. Thank you for the post about your response. I was about to start panicking! So I did the $35 reward but pledged $67 for the 35 reward, a beta key and a dig strat guide... how do I specify that? @Iesha Dover figure out what add-ons you want and simply add their dollar amount to your pledge. Later, you will receive a survey via email that will allow you outline what add-ons you would like. I just received an email response to my question about this. In regards to the add-ons, how will you guys know I want an early access beta key as opposed to an additional digital download copy? I didn't see an option to specify my add-on and the add-on "tutorial" doesn't address this possible mix-up. Thanks. I'm a bit confused about the addon's listed above. The reason is at $25 you are suppose to get a digital download. So if I were to add $25 to that is would be $50 and then I'd get two downloadable copies? of the game? But then at $35 you have listed all the previous rewards plus soundtrak and collector's book. So in you example of adding $25 making the total $60 that person would then get two copies? of the game plus soundtrack and book, right? I love all of your games, and wanted to give to this project the moment I heard about it. Unfortunately, DRM scared me off. I just donated $50 due to the fact I'll be able to get a DRM free version. Thank you for not treating your fans like criminals. What Fionavar wrote: "Really dont see a reason to waste money on translating the game, hopefully it wont be too much. Rather just want more content, since that would benefit everyone and not just the people who cant speak english, which frankly cant be that many. I guess as long as alot isnt wasted on it, its fine." Thanks for replying, I had misread the statement as them intending to add something like SecurRom, not that their original intent was to distribute via Steam. Just wondering why the $80 dollar tier doesn't get the VIP forum badge and special thanks in the credits? It is effectively the $100 tier without the t-shirt, Boxed edition of the game and the shipping costs needed to ship the physical game. It seems to me that the $80 tier is contributing more to the bottom line of the actual game and not towards rewards.